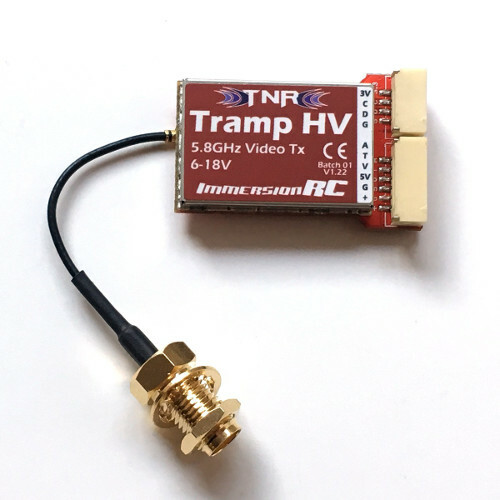 The TrampHV is one of today’s best video transmitters. Alongside all commonly used channels and selectable power levels, it boasts a flexible, replaceable connector, thermal self-protection, and the ability to control it remotely. This last feature is what we’ll be exploring in this article. One of the TrampHV’s only downsides is its poor user interface. Changing frequencies and power levels is a bit of a chore on the Tramp via its one-button user interface. It’s difficult and time-consuming to understand the blink codes provided through a single one-color LED indicator. Fortunately, ImmersionRC thought to give the Tramp the ability to be configured remotely. In addition to the Race Wand product, a Tramp can be configured through the flight controller. The Tramp comes with two cables for connecting video. For remote control, you’ll need the cable with a half dozen bare wires hanging off. 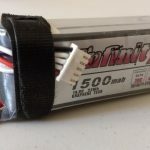 Find an appropriate place to pull power from the battery, using the red wire. Connect ground through one of the black wires. The Tramp provides a regulated 5V through the orange wire, which you can feed to your camera if you would like. The green wire is for audio input if you have a microphone. If you don’t, some say that tying this to ground narrows your bandwidth. If your flight controller has an OSD, you’ll need to feed the yellow wire from the Tramp to its video-out pin. Your camera’s yellow wire connects to the FC’s video-in. If you don’t have an OSD, the yellow goes straight from the Tramp to the camera. Leave the white wire alone, but protect the ends of any other wires you didn’t use by covering the bare ends or cutting them off close to the connector. When you’ve done all this, you’ll have the white wire which connects to the “T” pin on the TrampHV left over. To get the Tramp talking to your flight controller, you need a free UART. We’re using a DYS F4 Pro here, where UART6 is free. Find the TX pin for this UART and connect the white wire to it. (If you accidentally wire T to the RX pin, you might still be able to control it but the settings won’t save.) Connect your FC to Betaflight Configurator. Find the UART you’ve connected to and look in the Peripherals column. Drop this down and select “IRC Tramp”, then save. If you don’t see the option, you may need to update your version of Betaflight—you need at least 3.1. Your FC can now communicate with the Tramp! Next, you need a way to tell the FC what you want it to do with the Tramp. The two most useful methods are the Betaflight OSD, or a LUA script for the Taranis. 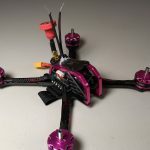 You will probably want the OSD method if you have a flight controller with that hardware, otherwise the script is a nice alternative, if a little complicated to set up. You can also use both methods together for more flexibility. 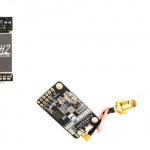 The Betaflight OSD method is simpler to set up, but requires a newer flight controller with the integrated OSD hardware. Once your OSD is set up, you’re basically ready to go with the TrampHV. Check out our Betaflight OSD guide to read about that process and the other benefits of the Betaflight OSD. To control the TrampHV, open the OSD, go to Features, then select VTX TR. From here you have a lot of information and settings. There’s a current status line, as best explained in the Betaflight wiki. You can select the band, channel, and power level as well as turn Pit mode on and off (not shown in the image below). A read-only field shows the frequency value of the band/channel combination you have selected, and another shows the Tramp’s current temperature from its onboard sensor. Changing the band/channel doesn’t take effect immediately; to confirm you will need to choose “set”. Once you do this your screen will probably go blank—you need to change your video receiver to match your transmitter settings to get the picture back. If you have a Taranis, there’s a LUA script available to let you control the Tramp right from a menu on the radio. The script also gives access to PIDs and rates! It’s more complicated to set up—but doesn’t require special OSD hardware within the FC. However, there’s an additional requirement of a functioning SmartPort Telemetry connection. 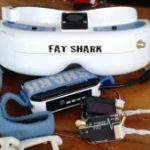 Use a FrSky receiver that supports telemetry. Most will, but the micro-size XM and XM+ are notable exceptions. The Tramp is still set up as described above, with the “T” pin connected to a free UART’s TX. You need an additional UART for SmartPort telemetry. Since you’re most likely using SBUS, this will tap out all of the UARTS on many FCs. In our screen capture above, UART1 is SBUS, UART3 is SmartPort, and the TrampHV uses UART6. Like SBUS, SmartPort is an inverted signal and you need to un-invert it to read the data. Some FCs (usually F3 boards) have hardware inverters on each UART that do this for you. Others (often F4 boards) only have an inverter on a single UART which is generally used for SBUS. When there’s no hardware inverter, you can mod your receiver to get the uninverted signal, or use SoftSerial and have the FC invert it using its processor. 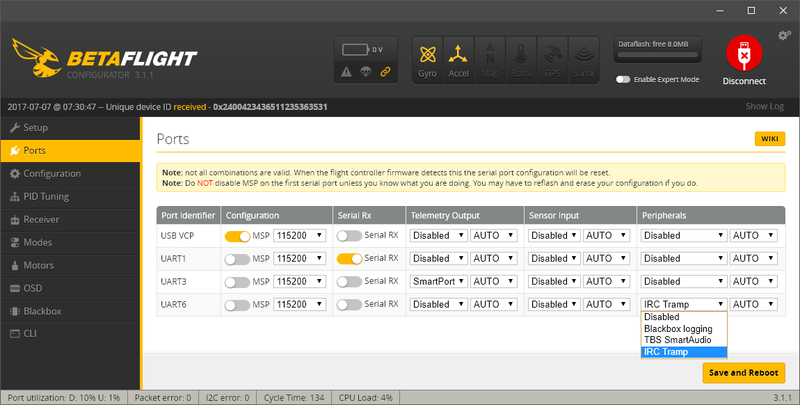 The Betaflight documentation has more information on both serial ports and telemetry. Another requirement is OpenTX 2.2. If you’ve never upgraded your Taranis, you are probably running an older version. It’s a bit of a process, requiring downloading and flashing firmware, upgrading your models, and replacing the contents of your SD card. Project Blue Falcon’s video series covers these steps, if you’re not familiar with them. After the update, you can download and install the LUA script to your Taranis, then assign it to a Telemetry screen in your model. This entire setup process is very nicely explained on this post. Be sure to read it and follow along if you’re having issues. You don’t have to use a “nightly build” for OpenTX, just use the most recent stable 2.2 release. When everything is (finally) set up, access the telemetry screens with a long press of “Page”. Inside the script, a short press of “Menu” will switch between PID, Rate, and VTX pages. Navigate these as you normally would with the Taranis buttons of +/- and Enter. One thing that’s not obvious here is that it takes a long press of “Menu” to confirm and save your changes. This script doesn’t give you the temperature/status like the OSD method will, but you can still control band/channel/power and pit mode. It also shows the selected frequency. Having remote control of your VTx isn’t a “need”, but it’s a huge step forward in usability. Once you get it set up, it will be hard to go back. While the big draw might be speed and convenience, having visual feedback for VTx settings also offers confirmation that you’re using the settings you intend. This is great for racing, or any flying with others, where knowing your frequency and how to change it is extremely important. The TrampHV’s biggest weakness—its poor physical one-button interface—is completely overcome when it’s controlled remotely. This alone elevates it from a really good VTx to a truly great one. There are a few other VTX units which provide remote control as well, like the TBS Unify Pro. We really hope this becomes a standard for every VTx going forward.